Hand Readings of famous people: Will Pranab Mukherjee make a good President? views. Check out a hand photo of his here and here. Pranab Mukherjee’s hand has a shortish, low-set Mercury (little) finger which is held apart from his hand, with broad and average length upper phalanges, and not just of his little finger. 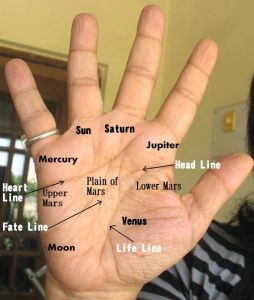 His fingers are mostly straight, and the mounts of Moon, Jupiter and Mercury are developed, as well as lower Mars. His palm is on the longer side, and fingers more short than long. His hand does not show political cunning, going by the shape of his fingers, despite being a veteran politician. In fact, Mukherjee's hand and finger shape show a certain naiveté. He is no doubt an aggressive type, evident from the quality of the palmar lines, the thumb and developed Mars mounts, but he is not very astute. Besides, he could lack diplomacy, pushy as he is. He will speak his mind, and is independent in his actions, which means that if he believes in something, he will do it, even if it meets with disapproval. This can result in some unusual ideas and actions, although not necessarily progressive, as his views tend to be fixed, even narrow, and also conventional. He may not always take into account the broad picture or get involved with larger issues, unless he feels it's his duty. These personality traits do not make him an easy person to get along with. He is certainly not a pliable person, but he is not egoistic. This does mean that while Pranab Mukherjee cannot be pushed easily, he can be manipulated. This becomes even more of a possibility as he is not easy with others, and his imagination which tends to run in the wrong direction, can be used to make him believe the worst. One of the reasons why Mukherjee has got where he is, is because of his leadership ability, superior executive and organizational ability, aggression and high ambition. Although Mukherjee likes power, he is an inherently straightforward man, not a crook. However, he can act in unfathomable ways due to his (at times) prejudiced thinking. He will no doubt make a good President, and there is really no comparison with the present one, Pratibha Patil who is an ordinary woman. If the hand readings of other senior politicians (links are given below) are checked out, it is easy to see why Pranab Mukherjee will make a worthy president. Hand Analysis of Sonia Gandhi or Hand analysis of Lal Krishna Advani or Mamata Banerjee's hands tell us about her character or Do Narendra Modi's hands show his complicity in the Gujarat riots of 2002? or What P. Chidambaram's hands tell us about him or Prime Minister Manmohan Singh's personality characteristics or Mayawati's hands reveal her personality characteristics or The Hand Analysis of Nitin Gadkari, the BJP President or Nitish Kumar's Hand Reading. For the younger lot of Indian Politicians and also international names check out the complete list of readings under the label "Politicians." Do you think that Pranab Mukherjee would have made a better PM than Manmohan Singh, based on their hand reading I mean. That is very difficult to say TN. Both have something the other doesn't. Manmohan's hand shows a much higher intelligence, perhaps brilliance but Pranab Mukherjee is a stronger man. However I am not sure how objective Mukherjee is capable of being. I wonder how you say that he is an independent thinker and does what pleases him/what he thinks is correct. If he was like that (only), its difficult to have reached the heights he has. Can people make an exception to their basic character? Can they be different with certain people? Ofcourse people are different with different people. And people have many layers. Also if you notice I said he has some fixed views, but he is also an independent thinker. You didn't bring this out, but both can be true. One can have some fixed views about certain issues, but also have some independent ideas. And yes he tends to do what he thinks is correct, but that is his personality and it doesn't mean he is able to. Other people may oppose him, and then he won't be able to. If he can, he will. That's what I mean. He needs to have the power and he will not listen to others. For example, if he had been made PM, he would not have been a pliant PM, like our present PM is. Also, there are some who will rough shod over others and very stubborn etc, but Mukherjee is far from that. Interesting. He could have been made PM instead of President, then.